The staff of The Center for Avian and Exotic Medicine celebrates the sacred bond between exotic pets and their owners. We strive to protect this relationship by nurturing an open, honest alliance with our clients and adhering only to the highest ethical and medical standards befitting these magnificent companions. 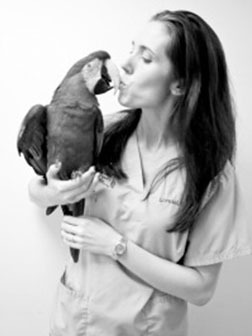 Alexandra Wilson, DVM, has over 10 years of experience working exclusively with wildlife and exotic pets. She received her Bachelor’s degree in Neuroscience from Oberlin College in 1998. After graduation, Dr. Wilson worked as a research scientist at Columbia Presbyterian Medical Center in New York City before deciding to pursue her long-time aspiration of veterinary medicine. In 2005, she received her veterinary degree from Ross University School of Veterinary Medicine. 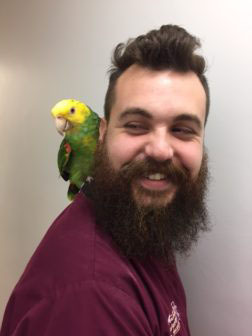 After further training with exotic pet medicine in Louisiana and Washington State, Dr. Wilson accepted an associate position at the Center for Avian and Exotic Medicine, New York City’s only exclusive exotic pet hospital. Since joining CAEM in 2007, Dr. Wilson has established expertise in the medical and surgical care of birds, reptiles, amphibians, fish, and small mammals. Dr. Wilson is also a consulting veterinarian for the Wild Bird Fund, NYC’s premiere wildlife rehabilitation and education center, Animal Care and Control of NYC, and the American Museum of Natural History. She has also worked closely with the ASPCA and local law enforcement on cases involving animal welfare. Dr. Wilson lectures locally and participates in the training of veterinarians, veterinary students, and veterinary nurses on the care of exotics pets and wildlife. Dr. Wilson shares her home with a naughty rabbit named Captain Larry and his girlfriend Greta, plus a tarantula named Omblik. 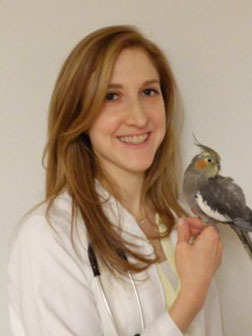 Jessica Grodio, DVM, PhD, ABVP (Avian) began work with us in early 2016. She attended prestigious Cornell University where she obtained a BS in Biological Sciences as well as her Doctor of Veterinary Medicine. Loving research, academia, and avian medicine, Dr. Grodio also earned a PhD from Cornell in Comparative Biomedical Sciences, for which she studied Mycoplasma gallisepticum, a bacterial species that causes disease in finches and has greatly impacted wild bird populations across the country. 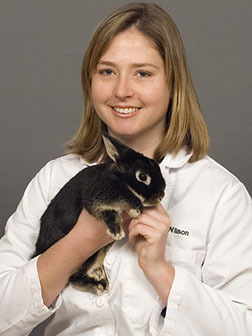 After receiving her DVM degree, Dr. Grodio worked with avian and exotic animal patients at Cornell’s exotic pet service. She then decided to pursue ABVP board certification in avian medicine and was accepted to a rigorous two-year residency in avian/exotic medicine and surgery at South Wilton Veterinary Group in Wilton, CT. 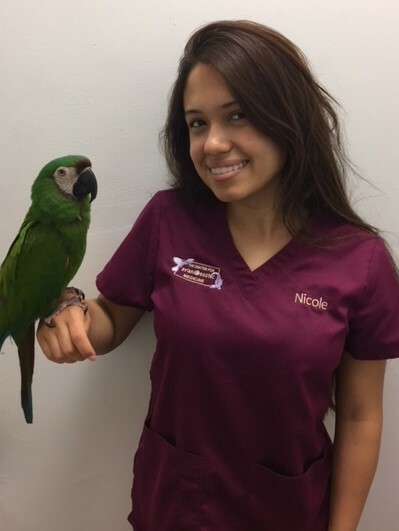 While studying for her board exams, she worked in the avian and exotic pet service at The Animal Medical Center in NYC and finally found her home with us! In addition to her experience with exotic pet species, Dr. Grodio volunteered her time helping sick and injured wildlife for eight years at Cornell’s Wildlife Health Center. 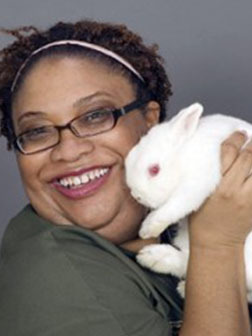 She has also worked with a variety of zoos and nature centers in the Northeast. Here she is with her beloved cockatiel, Pumpkin! Board certification is given to veterinarians who have completed additional training in one of the following categories: Avian practice, Exotic Companion Mammal Practice, Reptile and Amphibian practice. They have also fulfilled the stringent requirements mandated by the American Board of Veterinary Practitioners (ABVP). The ABVP is accredited by the American Veterinary Medical Association to provide board certifications in ten species categories. For more information visit: ABVP Specialty. We first met Dr. Lyle Cleary in 2009 when he was an undergraduate student/herptile enthusiast, looking to get experience with our exotic pet specialists. His enthusiasm and drive to learn everything he could about these animals kept him coming back every holiday break and summer vacation, first as a volunteer, and then an employee. 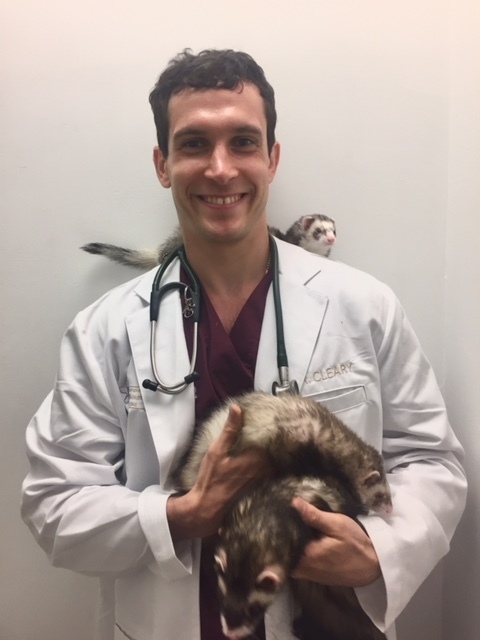 During his veterinary studies at Tufts University, he continued working with us during his breaks from vet school, and as an extern through the University. While at Tufts he worked at the Wildlife hospital there and interned with their prestigious Zoo/Exotics department several days a week. From 2014-2016 Dr. Cleary worked at the Tufts University Wildlife Hospital assuming care of the 4th year student cases. He also spent several months working at the Australian Reptile Park in Somersby Australia, as well as the Madras Crocodile Bank Center for Herpetology in Namil Nadu, India. Upon graduation, he received the Senior Zoological and Companion Exotics Award. After graduating, Dr. Cleary embarked on a challenging one-year rotating internship at Brooklyn’s Veterinary Emergency and Referral Group. There he quickly became the go-to exotics vet for emergency cases and he was able to hone his clinical and surgical skills. Finally, after almost 10 years of study, research, practice, and advanced training, we are able to welcome Dr. Cleary to the Center as our newest associate! He shares his home with a pair of Argentine Tegus, a Black-Throated Monitor, several Newts, and a one-eyed boxer. Lorelei has been with the hospital as the practice manager and nursing team member since it opened in 2004. Originally from Boston, she received her BA in journalism from Boston University. Lorelei’s lifelong love of animals, especially birds, eventually pulled her away from writing into the field of veterinary medicine. After graduating from the Veterinary Technology program at Mercy College in 2001, Lorelei has been working exclusively with birds and exotic pets. In addition to being an outstanding nurse with many years experience, Lorelei’s special interest in exotic animals has allowed her to contribute to the field as an educator. 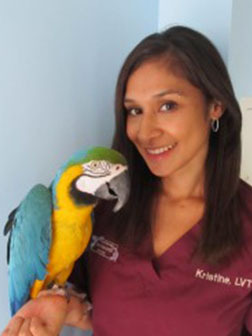 She has been an adjunct teacher of avian and exotic medicine at a local veterinary technology program, plus lectured at several national and international veterinary symposiums. She also has authored text book chapters, journal articles, and edited several professional publications. Lorelei was a founding member and is a past president of the Academy of Veterinary Technicians in Clinical Practice (AVTCP). The AVTCP is the ninth officially recognized veterinary technician specialty (VTS) and is modeled after the American Board of Veterinary Practitioners (ABVP). In January, 2018, Lorelei earned the status of Certified Veterinary Practice Manager (CVPM) through the VHMA (Veterinary Hospital Managers Association). She shares her home with a Jenday Conure,a Double Yellow Headed Amazon, and a Green Wing Macaw. Kristine earned her BS in veterinary technology from Mercy College in 2011 and joined our team before she even finished school! We first met her when she elected to undergo a rigorous 6 month externship with us in her final year of college. After getting a taste of how amazing exotic pets were, she knew she was hooked! Her heart belongs to all things ferret- but recently, as often happens, she has been bonding with te large psittacines here… we shall see if her family will grow! Anita found us when she applied here as an intern from Mercy College, looking for a hospital that specialized in exotics. She completed a semester long program here, after which we decided we could not let her go! She finished school, earned her bachelor’s degree as well as her New York State LVT, and has been working here since. Her extended animal family includes a rabbit, 2 rats, a dog, cat, and newest addition of 2 budgies! Vicente is a veterinarian in Chile who came to NYC to support his wife while she is in graduate school. In Chile, he has worked as a veterinarian with non-traditional species (exotic animals) since 2014, and before that he worked with exotics for many years as a medical student. Being here for only a short time, he is unable to obtain his veterinary license to practice here, however he has been able to obtain his LVT to work as a veterinary technician! So we are thrilled to have him as part of our medical team. Chaya has been working and volunteering in the veterinary field for many years, including spending several weekends volunteering here with us when she was in nursing school. Her studies ultimately took her to SUNY Delhi, where she excelled and graduated at the top of her class. 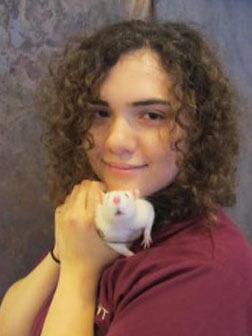 She has rescued several animals, and is particularly fond of the fuzzy little rodents-owning rats, mice, and hamsters. She also loves birds and is the proud owner of a darling ring- neck dove. 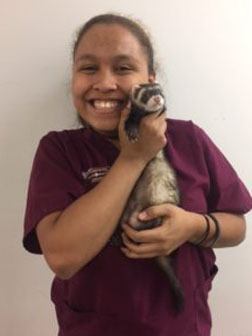 Chaya’s lifelong dream has been to work as a licensed veterinary technician with exotic pets, and we are excited to have her as part of our team! As we were looking for someone to help keep the animals and hospital clean, we came across a caring, fun, animal loving student named Summer! She comes to the hospital every day after school to make sure the hospital is clean for both the clients and the pets. She also helps the nursing staff make sure all patients are clean, fed properly, and have fresh water. Summer lives with her family, which includes 3 cats and 2 new rabbits she adopted from us. Her goal is to get into college and study drawing! Elizabeth is a pre-veterinary undergraduate student at Hunter College majoring in psychology and minoring in biology. You can find her volunteering at local animal shelters, working with larger animals at a local barn, and shadowing veterinarians. Since starting work at our center, Elizabeth has learned a lot about exotic veterinary medicine. She is very active and loves to be outside whenever she can. She has a Jack-Russell Terrier and wishes to adopt more animals once she completes her veterinary degree. Nicole is a pre-veterinary Hunter College graduate with a BS in biology. Some of her hobbies outside of caring for animals include fitness and nutrition. Currently, Nicole volunteers for a program that works with horses and children with disabilities, and in the past she volunteered with an animal shelter. 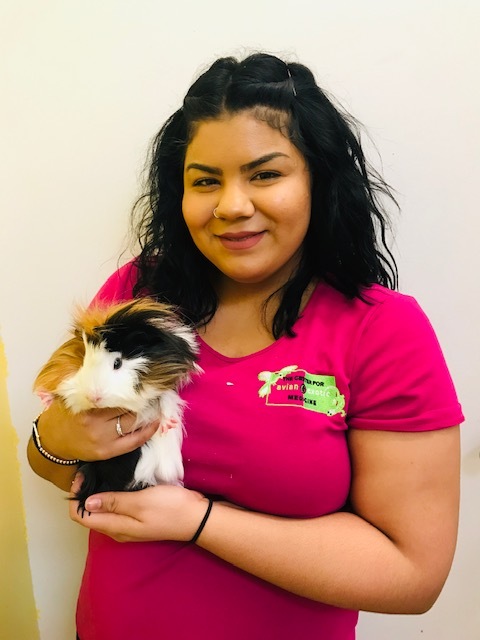 She enjoys volunteering her time for animal related programs, and hopes that this dedication will help in her application for veterinary school. Her career goals are to not only become a veterinarian, but to specialize in exotic medicine. Last but not least, she has a Yorkie who she adores, and she hopes to have more of a variety of animals as she progresses in her career. 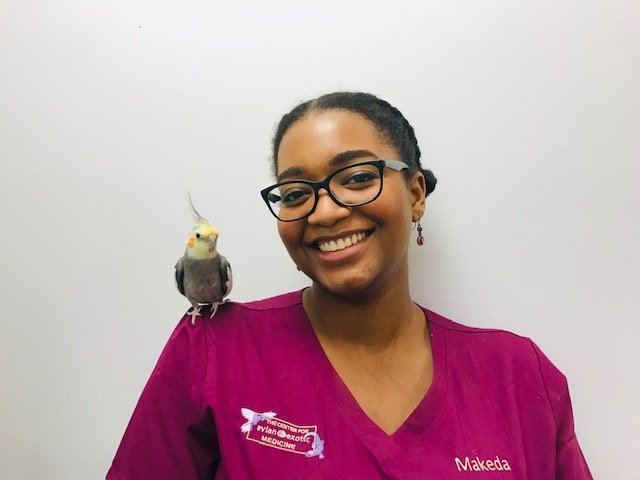 Like many veterinary assistants who have worked with us, Makeda is a veterinary technician student at Mercy College. She is in her second year towards becoming an LVT and enjoying the technician program. Her favorite kinds of animals so far are anything “scaly, creepy, or crawly!” and some day, she hopes to travel to Australia for some trekking to see some venomous snakes in the wild. Meanwhile, she is so excited to be learning about birds here with us, as well as all of the other interesting animals she helps care for. While not studying or working, this self-proclaimed "Anime-Nerd" loves spending time in her garden, cooking, reading, and hanging out with her 2 gramdmothers AND her great-grandma! Aliza grew up right here on Manhattans' Upper East Side. She received her Bachelor’s degree from University of Massachusetts, Amherst, where she was an English and Animal Science major. Her favorite time at school was working with the sheep and goats in Western Mass., and the seed was planted that she wanted to be a veterinarian. She is currently taking a slight detour while she earns an MFA in Creative Writing at City College, but she plans on applying to vet school in the next year or two. Meanwhile, she is having a great time working with all the amazing exotic animals we treat here at the Center, and she has her heart set on rescuing a Chinchilla! After studying Human Behavior at Long Island University, Tracy decided to follow one of her passions and attend Culinary School. Our “resident chef” says that working at the Center for Avian and Exotic Medicine allows her the opportunity to combine both of her passions: the culinary arts and love for animals. Whether preparing a gourmet meal for her family and friends or for a catering job, Tracy always shares some of her famous healthy treats with the rest of the staff! Shania is a Queens native and has always loved animals. She is an explorer at heart, always wanting to try new things in NYC, and hopes to be able to travel around the country, and the World in the future! She loves DIY projects and crocheting, especially when it involves her 3 favorite creatures- her guinea pigs! Lila, Max, and Nike have stolen her heart and she spends as much time as possible finding new ways to keep them happy. Erika joins are front desk team with a very diverse background. She was a dance major at the New World School for the Arts, and is now undertaking a vigorous program in massage therapy at the prestigious Swedish Institute. She found us because she is also a reptile enthusiast, owning a large Ball python, a red-tailed Boa constrictor, and a box turtle. Her future will be full of scaly friends, massages, and dance… what could be better? ?